Home / Editorial / Is Crowd Funding The Answer For A Throwback Friday The 13th Film? 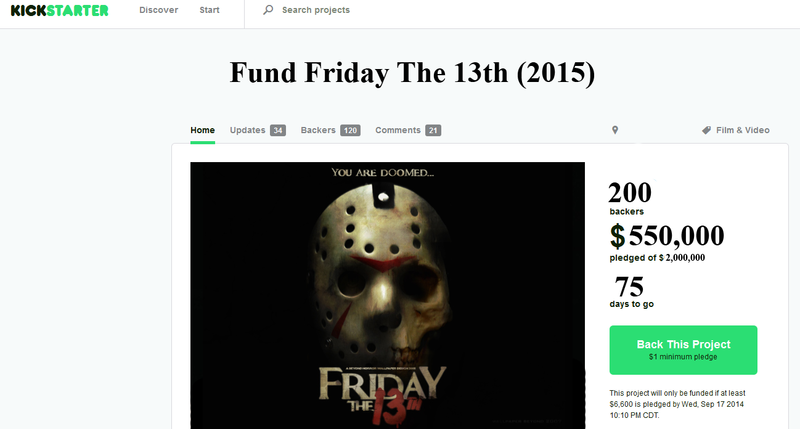 Is Crowd Funding The Answer For A Throwback Friday The 13th Film? As all Friday The 13th fans wait to hear some updates on the new Friday The 13th film in development at Paramount Pictures, there is still a lot of questions to be answered about what the new film will be about. Will the new Friday The 13th be filmed in 3D? Will a found footage technique be used to create the thirteenth film in the franchise? Is the new film going to be a sequel, prequel, or reboot? With all of these questions still hanging over pre-production of the film that Platinum Dunes is producing, many fans have expressed the opinion that it really shouldn't be too complicated to create a classic Friday The 13th film to release into theaters for fans to enjoy. Well, what if it is all about the money and the financial burden that that studios are fearful to take on? The earlier Friday The 13th films that were released in the 1980's were all negative pickups, films that were independently financed separately from Paramount Pictures. Phil Scuderi and his group of financiers from Boston paid to create the films while Paramount incurred the costs to market and distribute each of the films into theaters. It was a profitable formula as each of the first eight films in the franchise cost a rough average of $2.5 million to make with Friday The 13th Part 8: Jason Takes Manhattan being the most expensive at $5 million. The U.S. domestic box office receipts produced an average of $25 million per film for the original eight Paramount films in the franchise. With the franchise averaging an up front profit of around $20 million per film, it made sense for all parties involved to continue making sequel after sequel and the films still contained an independent, grindhouse type feel to them. After the 1980's ended and the Friday The 13th franchise distribution rights were sold to New Line Cinema, the independent financiers disappeared leaving the original film's director Sean Cunningham holding the rights to create any new film in the franchise. It would be his burden to generate the financing for any new film that was not ordered by the studio and his new Friday The 13th films would become negative pickups. With the Horror landscape in serious flux in the 1990's and little interest by New Line Cinema to spend money on anything related to Jason Voorhees outside of their Freddy vs Jason team-up, Sean Cunningham created his next two entries in the franchise on somewhat modest budgets, Jason Goes To Hell and Jason X. The two films were admirable entries in the series, but lacked a lot of the classic appeal that fans had become accustomed to seeing earlier in the franchise. Although the two films did show their low budget, the actual content of the films themselves did not resonate the same feelings as previous entries. In the 2000's. New Line finally put studio money behind their pet project Freddy vs Jason with over $20 million spent. The film performed very well, and a few years later New Line Cinema's new parent company Warner Bros. decided to move forward on a brand new stand alone Friday The 13th film. Although Friday The 13th 2009 had a somewhat large budget of $19 million, the end result left fans disappointed with feelings of good intentions incorporating a throwback idea to the original four films, but lacking in execution on-screen. So, here we all are in 2014. It has been well over 5 years since the last Friday The 13th film made its way into theaters and we are anxiously awaiting news on what we can expect in Crystal Lake in a new decade. There is just one problem, the project has been delayed once already and there has been word that a script and direction of the new film has not even been determined yet. Many fans and film industry insiders point to creative differences. That may be the case, but doesn't the real problem come down to the basics of money? Paramount doesn't want to spend any real money on making the film. Because of this fact, Platinum Dunes' hands have been tied in a creative process of coming up with a viable thirteenth film in the franchise that will appease fans and can be made on the cheap. What if Sean Cunningham and Platinum Dunes said the hell with it and turned to the fans to help finance the newest Friday The 13th flick? We're not talking about a Kickstarter of a measly $1,000 dollars, it would be more like a minimum of $2-4 million. That kind of money can get an excellent Horror film made, especially with a talented director like David Bruckner involved in the project. Of course there are a majority of fans that would be extremely skeptical of giving money to such a project, but would our readers ever be interested in donating a sum of money to a Friday The 13th project with the promise of returning the franchise to its grass roots of storytelling and visuals? Crowd funding may be the one true way left in the modern filmmaking era to get that Friday The 13th film of old released into theaters.